I have a rule about Pinterest : no pinning unless I'm going to be doing. It's far too easy to get sucked into the time vacuum that is social media. But when I'm looking for inspiration, Pinterest does not disappoint. Three weeks ago, I found this gem of a (free) pattern. I clicked on the instructions, but they weren't in English. Never fear! 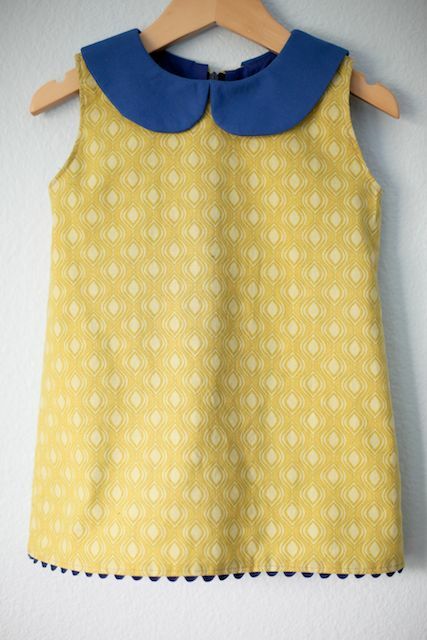 With the help of Google Translate, I was off, embarking on my own little sewing adventure. While Google Translate is way better than nothing, it only pointed me in the right direction rather than making the instructions crystal clear. There's a reason we have the expression "lost in translation". 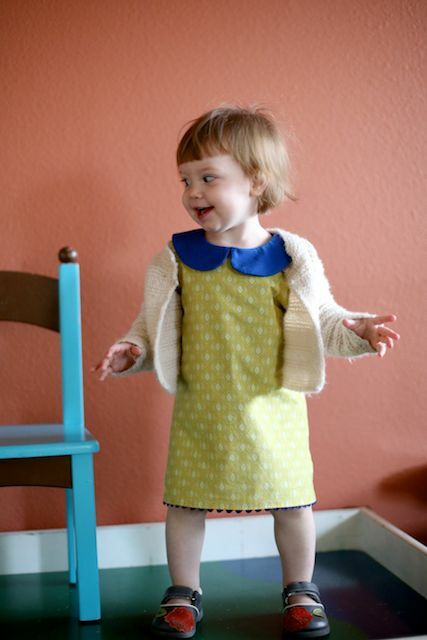 Thankfully, it came together a lot like the Oliver + S School Photo dress. It's lined with an invisible zipper closure. 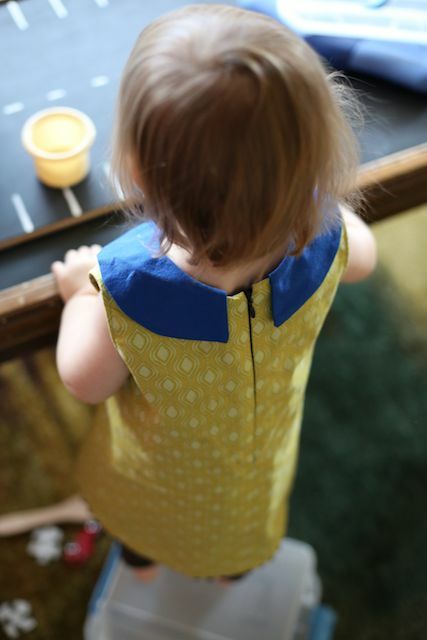 I basically followed that pattern to assemble this dress. 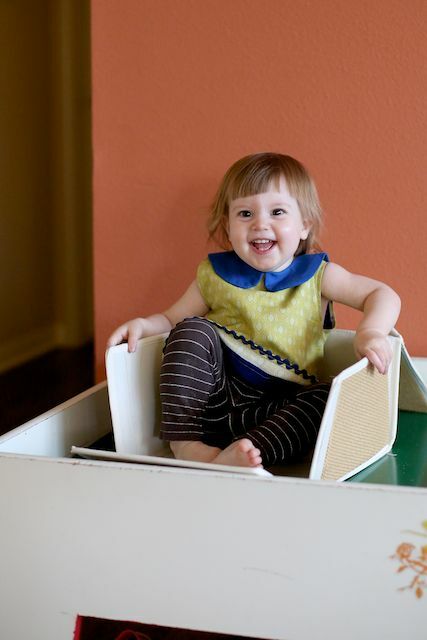 Since I was making it for Miss Iris (MisRis for short) :), I took more liberty in my fabric choices. I was inspired by a scrap of fabric from Moda Momo Wonderland. It's olive with blue dots. 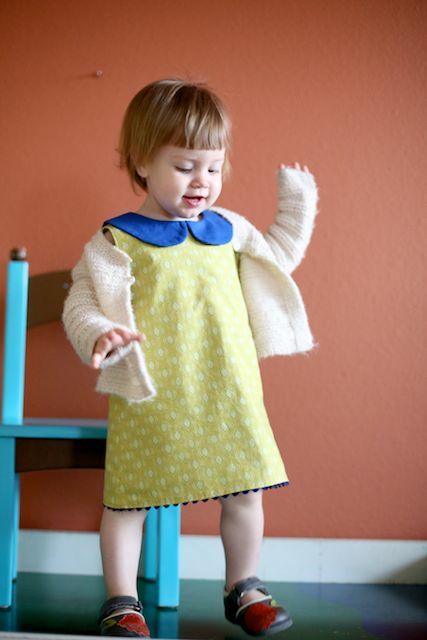 I can't find it online anymore, but I used it for a sash and ruffle here and for the bodice of this well-loved dress. I used Valori Wells, Cocoon, Shine Bamboo which I was planning to use for the backing of this quilt that I never finished. 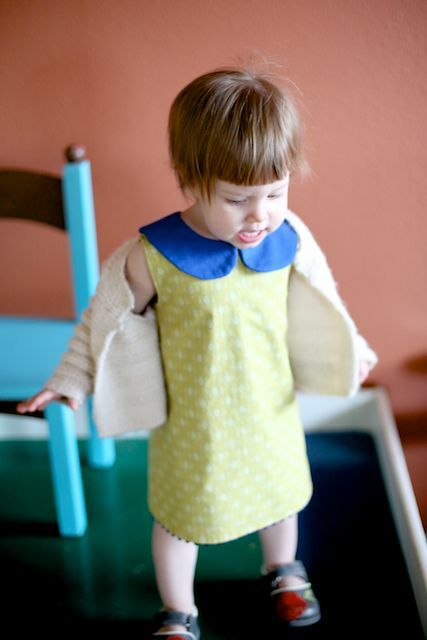 The peter pan collar is in Robert Kaufman Kona Cotton - Royal. I lined it with Michael Miller Cotton Couture which was perfect as a lining - so silky and airy, light and soft. I loved it. I added some navy ric rac to the hem. I used a navy invisible zipper for the back closure. There were a few firsts with this dress. It was the first time I've added my own seam allowances to a pattern. It was also my first time using a pattern not in English. I did need to use another pattern to fill in the gaps, but it came together in the end. There was some confusion and frustration in trying to finish the armholes. Indigo tsked me saying, "See, Mom, this is what happens when you don't use a pattern." It's true. But once in awhile it feels good to step outside of the ol' comfort zone. I'm glad I did. 1. I LOVE the rick rack. Excellent addition and really brings it all together. 2. I love the color palette you chose. 3. I am impressed with you breaking the language barrier. 4. I LOVE dresses that are versatile for our Texas weather. leggings and a sweater for winter & no leggings/sweater for summer. 5. 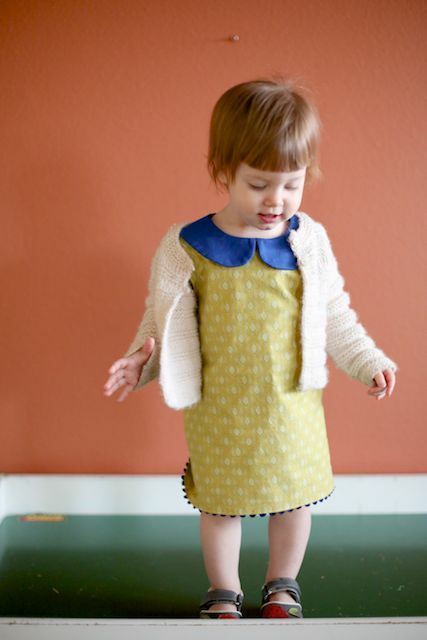 Could you find a cuter toddler model? uh no.